I feel like I’ve been juggling a million things in the last couple of weeks, and this week in particular is kind of the tipping point of crazy town. So I’ve been calling on friends (and Jeff) a lot recently to help me with a few things. And I really want to do a little something nice for them to say thanks for being so great. Naturally, I thought donuts! Everybody loves donuts, right? 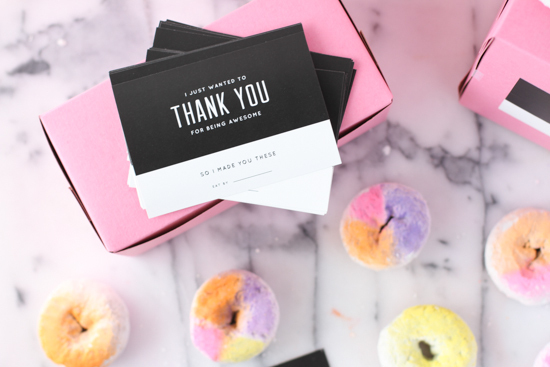 So, I partnered with Makr to put together some thank you labels for boxes filled with DIY baked goods. If you aren’t familiar with Makr yet, it’s a really cool iPad exclusive app, where you can customize a variety of designs/ templates for practically any paper goods you can think of: invitations, stickers, business cards, postcards, labels, tags, recipe cards, stationery, and more. Then print them out or have them professionally printed and shipped right to your doorstep (that’s what I did and the quality is top notch). The app itself is really well designed and SUPER easy to use. I started with one of their templates and completely customized it to feel ‘more me’ in about 15 minutes. 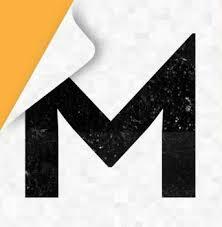 You can download the Makr app for free right here, if you’d like. 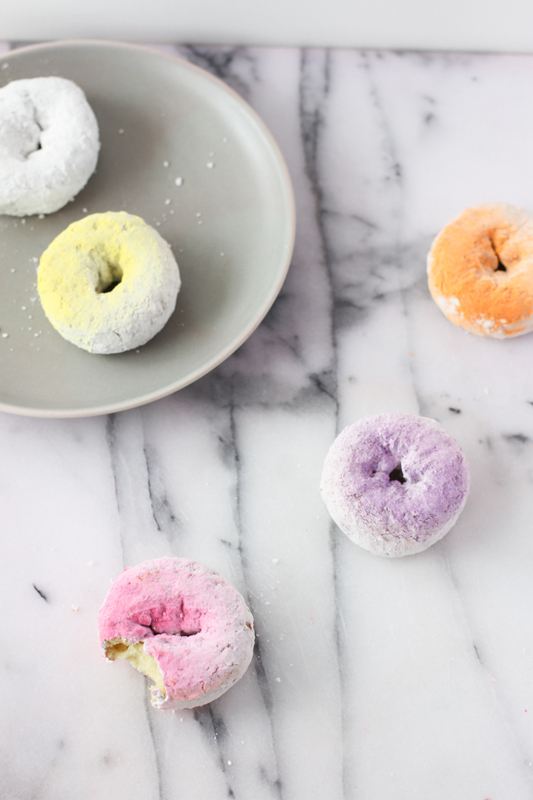 Color Blocked Donuts: Place a powdered donut on a plate to protect other surfaces from the edible spray. 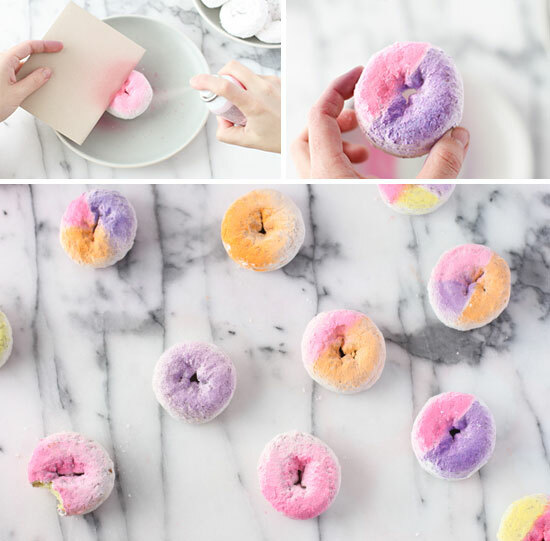 Then cover over part of the donut with a piece of paper. Lightly spray the uncovered area. Wait until dry. Then cover the sprayed area and spray additional colors in the same way, for a color blocked look. 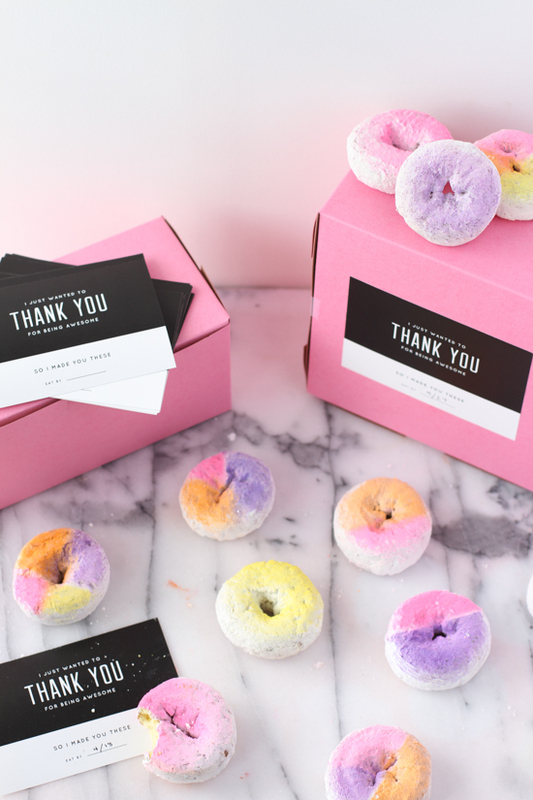 Once dry, place the donuts in a small bakery box, add a thank you label (don’t forget the ‘Eat By’ date), and you’re done. 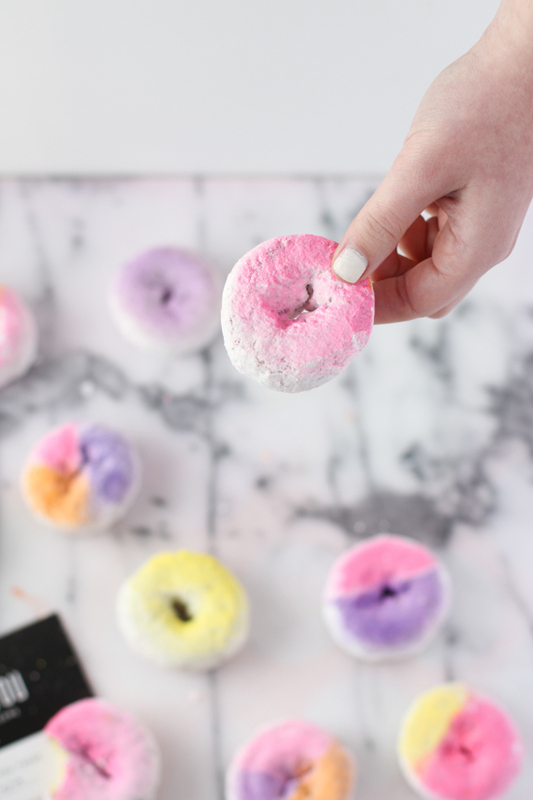 Ombre Donuts: You can also create ombre donuts super easily by building up color at the bottom and then very lightly spraying upward from there. 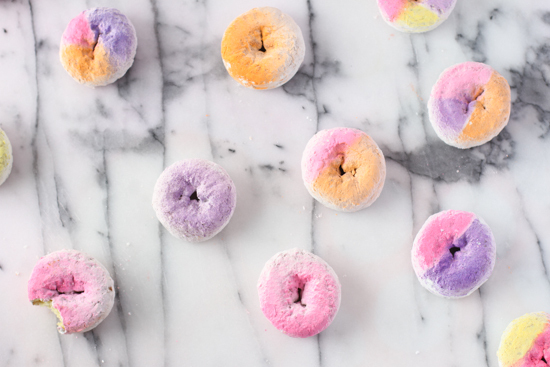 If you’re pressed for time, this is a super quick way to dress up store bought donuts, but if you want to make your own donuts instead, there are lots of great recipes out there. This one looks like a good one to try. Aside from a last minute thank you idea, this would be a good project to try for Easter too. 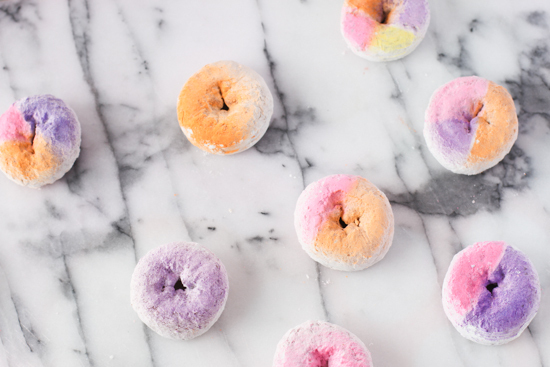 You could even stick the donuts in plastic Easter eggs for the holiday egg hunt. What do you think? Do you like the ombre or color blocked version best? ***Special Makr Offer for Paper & Stitch fans: Enjoy a free Makr credit AND 20% off a print order! Just register with the referral code PSTITCHFAN and enter same code at checkout. Easy as donuts pie. Download the Makr app here (it’s free) to customize your favorite designs and make ’em yours. This post is sponsored by Makr. All opinions are my own. 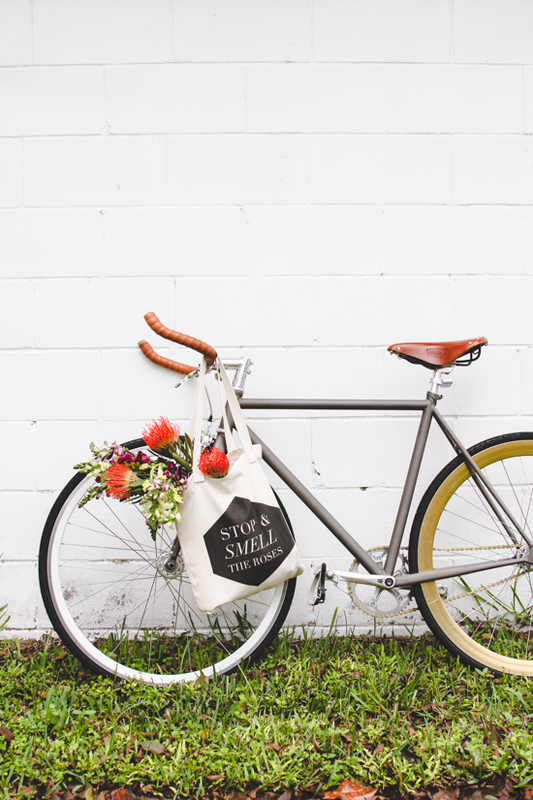 Thank you for supporting the brands that make this blog possible. So cool!! I didn’t know they made food color misting spray. Mind blown. I know, right? My friend Lexy told me about it. It’s the best. There’s such a thing as colour mist edible spray?! Oooooooooo, this is going to change baking in my house, big time! And now you will officially be known as “The Most Brilliant Woman on the Planet.” These. Are. Un. Real. New favorite right here! Obsessed! These are going to take over the world!!! COME ON! These are just WAY too cuuuuute!!! I can hardly bare it. They’re too cute to even eat! They look delicious and they are in my favorite color! Too cute. Yeah, the spray is really great, Catherine. Super easy to use too. 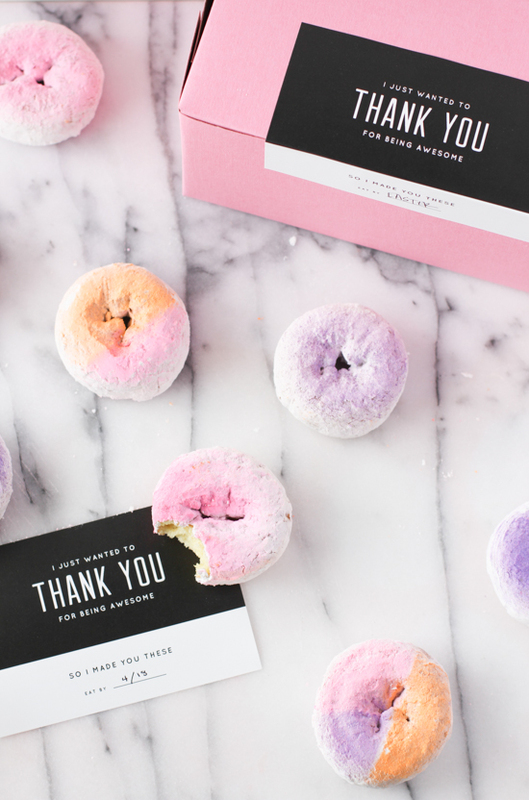 Churp Churp - DIY ideas to blow your mom away this Motherâ€™s Day! Hi Jen. I customized one of the large label templates to what you see in the photos. 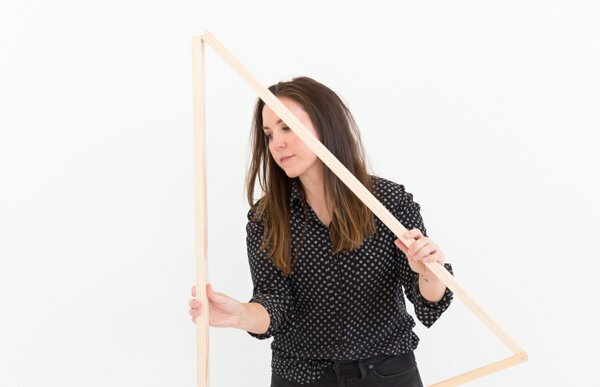 I believe you may be able to get to the exact label from Makr’s post that they wrote about my project. Here’s that link: http://www.makrplace.com/paper-stitch/ There’s a column on the right hand side that you should be able to click on if you’re signed into the app.